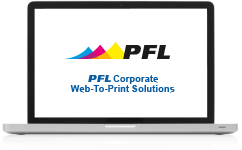 Who Uses PFL's Corporate Web To Print Solutions? Our corporate web to print solutions are perfect for larger organizations such as franchisors, manufacturers, distributors, and direct selling organizations, as well as HR professionals, office managers, and anyone else who needs frequent, hassle-free print ordering combined with rock solid brand control. With your easy to use custom website, we allow you to print and manage your job from anywhere. Fill out the form for an exclusive demo.